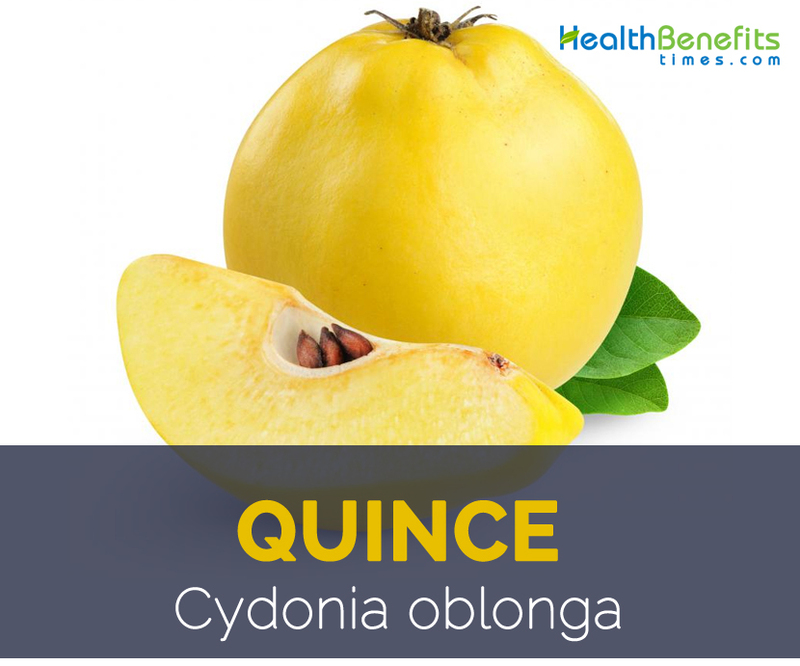 Quince scientifically known as Cydonia oblonga is actually the sole member of the genus Cydonia in the family Rosaceae which also contains apples and pears, among other fruits. It is a perennial shrub or small tree and is native to western Asia. 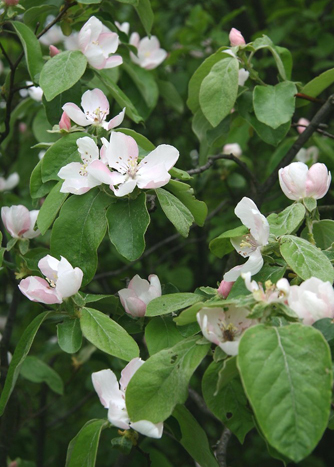 Quinces are very adaptable, low maintenance and cold hardy trees and rarely require fertilizer. These trees prefer heavy, wet soils. Regular deep watering during the hot summer months is helpful to fruit production. Since quince is in the rose family they are susceptible to some diseases. However, good care of your tree can help prevent problems. Apple-shaped Quince, Common Quince, Quince, Quince Seeds, Quince Tree are few of the common names of Quince. They are excellent for jams, jellies, preserves and wine. They ripen in fall and are still hard, but bruise easily. The fruit will keep a few weeks when refrigerated. Orange, Champion, Pineapple, Angers, Smyrna, Van Deman, Rea and Meech are few of the popular varieties of Quince. Quince is a deciduous, unarmed, perennial shrub or small tree 5 to 8 meters (16 to 26 ft.) high and 4 to 6 meters (13 to 20 ft.) wide with crowded gnarled branches and branchlets. 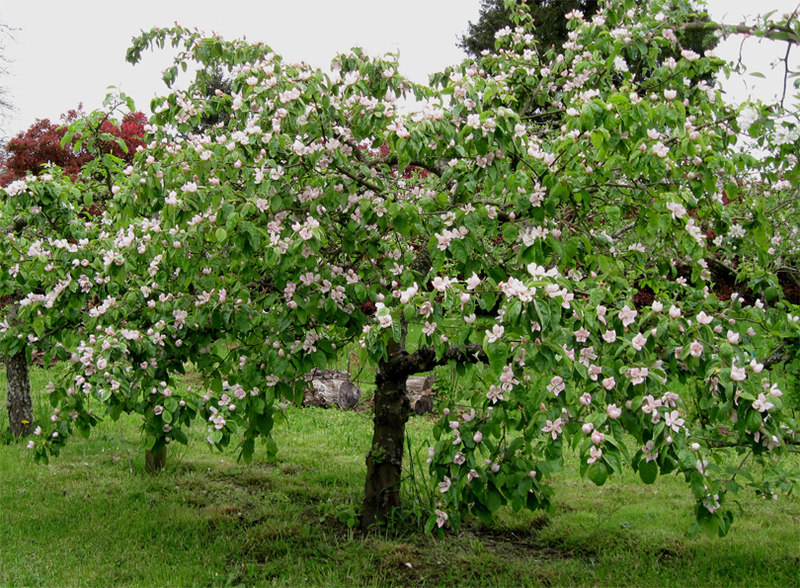 Warm, sunny, sheltered spot is required as the flowers are susceptible to frost and sun is needed for the fruit to ripen. 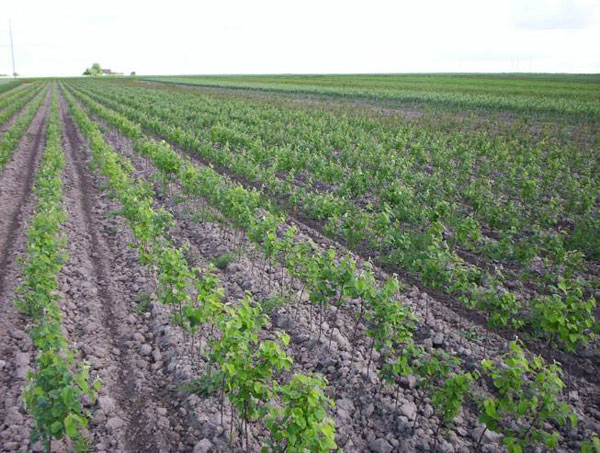 It tolerates a range of soil but grow best in a deep, fertile, moisture-retentive soil. Branchlets are normally purplish red when young, turning purplish brown with age, terete, initially densely tomentose becoming glabrous when old. Leaves are alternate, petiolate (0.8–1.5 cm long) with caducous, tomentose ovate stipules. Lamina is simple, ovate to oblong, 5–10 × 3–5 cm, lower surface pale green with conspicuous veins and densely villous, upper surface dark green glabrous or sparsely pubescent when young, base rounded or sub-cordate, margin entire, apex acute or emarginate. Flowers are 4–5 cm across on tomentose pedicel with caducous, ovate bracts with campanulate hypanthium which is densely tomentose abaxially; sepals 5, ovate or broadly lanceolate, 5–6 mm, longer than hypanthium, both surfaces tomentose, margin glandular serrate, apex acute; petals 5, white or pinkish, 1.8 cm long; stamens less than 1/2 as long as petals. Styles are nearly as long as stamens, densely villous basally. 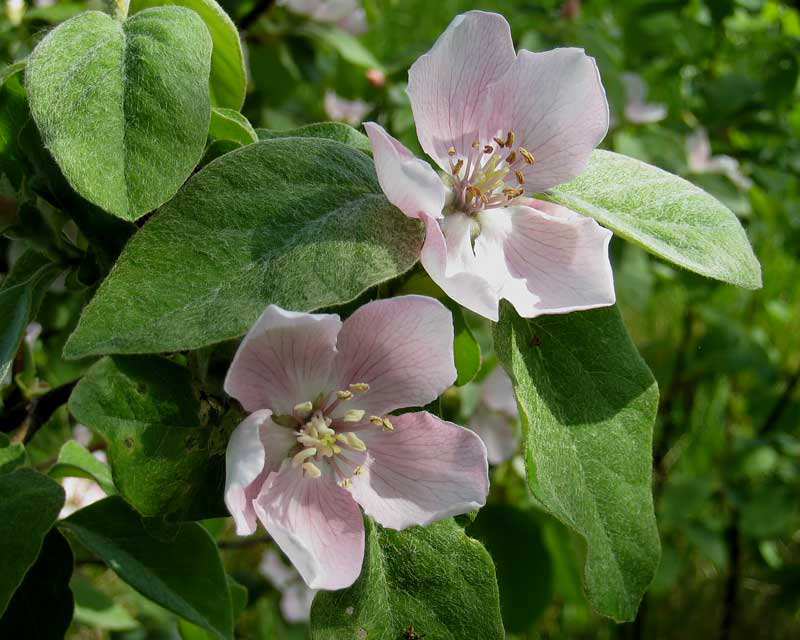 Quince plant offers fragrant, pear-shaped fruit, 7 to 12 centimeters (2.8 to 4.7 in) long and 6 to 9 centimeters (2.4 to 3.5 in) across, densely tomentose with tenacious reflexed sepals and stout, tomentose fruiting pedicel, 5 mm long. Pulp is firm, fleshy and aromatic. Fruit is normally light green while young turning yellow as soon as they ripe. The fruit is larger than average apple and bumpy; appear somewhat like large guava, avocado, or as short-necked pear fruit. Its fuzzy surface is smooth as in peaches. Quince fruit weighs about 250-750 g or more in some varieties. External skin is normally fuzzy and has light yellow, gritty flesh. Fruit has intense fruity aroma and has astringent, acidulous taste. They are too hard, too tart, too acidic, too sour, and too generally unpleasant in taste and texture to eat raw. Sufficient cooking, however, softens them and brings out the floral aroma they hold deep inside along with a lovely sweetness. Harvesting ranges from mid-February in warmer areas with the very early Missouri Mammoth, to late April in cooler districts with the Van Deman. Quince is indigenous to Western Asia; its primary wild area is perhaps limited to the Caucasus – Armenia, Azerbaijan, Turkmenistan, and the Russian Federation – Ciscaucasia, Dagestan. Partially connected with this core area are populations in Iran, Anatolia, Syria, Turkmenia and Afghanistan. Due to its unique taste and higher nutritional value it is grown throughout the world. Apart from their astringent, acidulous taste, Quince is a good source of nutrients, vitamins and minerals. Consuming 92 gram of quince offers 0.6 mg of Selenium, 13.8 mg of Vitamin C, 0.12 mg of Copper, 14.08 g of Carbohydrate, 0.64 mg of Iron,1.7 g of Total dietary Fiber, 181 mg of Potassium,0.037 mg of Vitamin B6 and 16 mg of Phosphorus. Phenolics present in Chinese quince are effective in relieving gastric ulcers. 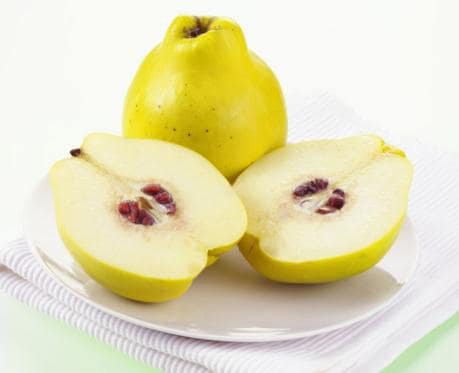 Quince juice is beneficial for people suffering from gastric ulcers. It also helps in the treatment of peptic ulcers as it calms the gastrointestinal tract. Ripe quince fruit is actually a wonderful source of Vitamin C, contributing nearly 25% of the suggested daily allowance (RDA). Vitamin C helps to boost immunity and aids in the treatment of inflammatory conditions. It also possesses anti-allergenic properties and can also be used in the preparation of food products for allergy sufferers. Quince is mostly grown for its edible fruit, although its flowers are also edible. Only cultivars with a soft skin, matured in a warm climate can be eaten raw. Quince are roasted, baked or stewed or processed into jams, marmalades, pastes, jelly and quince pudding. Quince paste is still extensively made in France and Spain, while in Argentina, Chile and Uruguay quince is cooked into a reddish jello-like block or firm reddish paste known as dulce de membrillo which is then eaten as a spread in sandwiches and with cheese. Boiled quince is also popular in desserts such as the murta con membrillo that combines Ugni molinae with quince. Fruit is cooked into a firm reddish paste and is eaten with manchego cheese in Spain. Quince is cooked in pomegranate paste (dibs rouman) with shank meat and kibbeh (a Middle Eastern meat pie with burghul and mincemeat) and is called “kibbeh safarjalieh” in Syria. Fruit it is used in mixed products including juices pure and mixed, liqueurs, wine, cider, fruits in liqueur, jam, marmalade, jelly, and dried jelly as a special “quince-bread” due to its strong and intensive fragrance and flavor. Quinces are used for flavoring apple pies, ices and confections. Quince juice mixes well with other fruit juices. Quince is made into brandy in Bosnia. 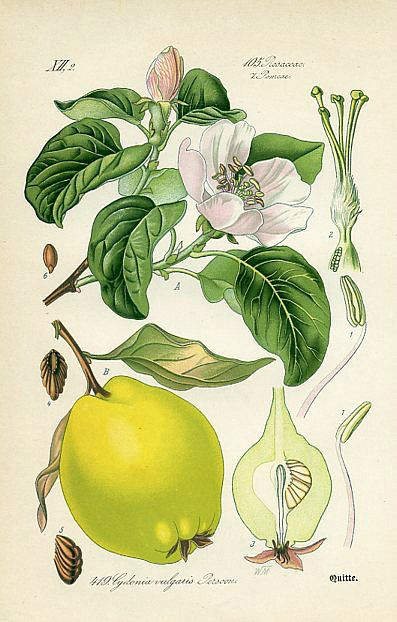 Quince wine was popular in Britain in the nineteenth century, and was reputed to be beneficial to asthma sufferers. Quince scalding water, rich in phenolic compounds, flavonoids, organic acids and sugars could be used in low-fat yogurt production. 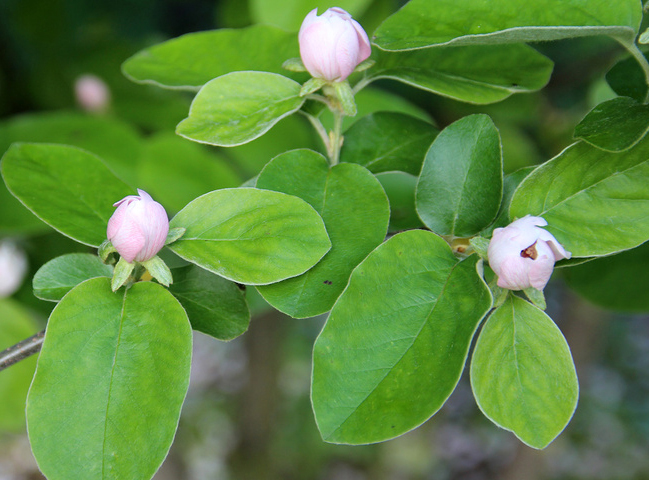 Quince has been used as an herbal medicine since ancient times. Fruit is antivinous, astringent, cardiac, carminative, restorative, digestive, diuretic, stimulant, emollient, peptic, expectorant, pectoral, refrigerant, and tonic. An infusion is used for sore throat, diarrhea and hemorrhage of the bowel. It is effective against inflammation of the mucous membranes, intestines and stomach. Fruit and its juice are used as a mouthwash or gargle to treat mouth ulcers, gum problems and sore throats. 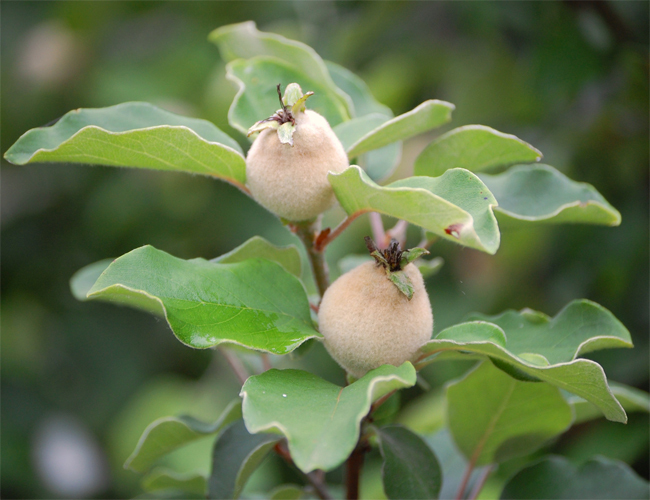 Quince is used in the cosmetic industry and for medicinal cosmetics. Unripe fruit is very astringent; syrup made from it is used in the treatment of diarrhea and is particularly safe for children. Pectin is said to protect the body against radiation and has a beneficial effect on the circulatory system and helps to reduce blood pressure. A teaspoon of quince jam dissolved in a cup of boiling water relieves intestinal discomfort in Malta. Leaves contain tannin and pectin. Tannin can be used as an astringent. Stem-bark is astringent and used for ulcers in Chinese herbal medicine. 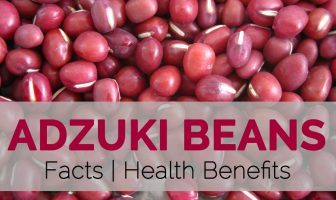 Seed is a mild but reliable laxative, astringent and anti-inflammatory. 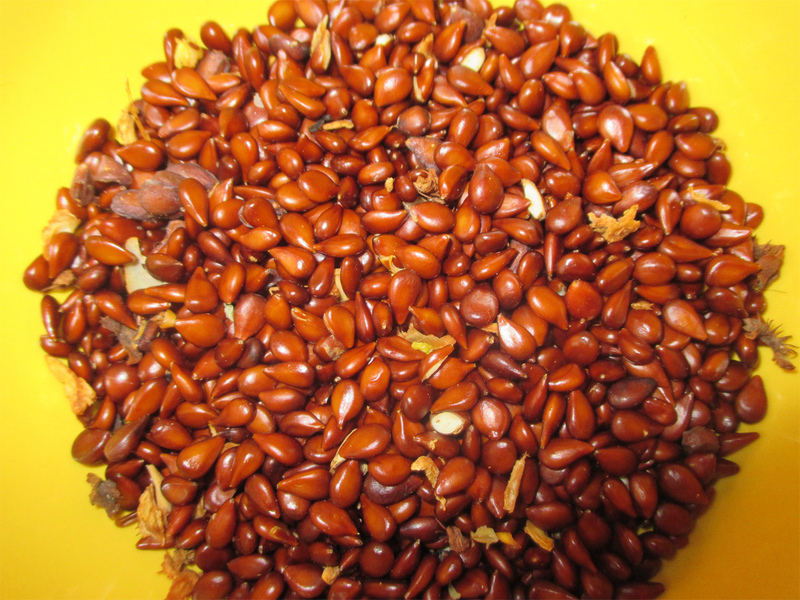 Seeds are used as a remedy for pneumonia and lung disease in Iran. Quince seeds are collected and boiled and then ingested to combat pneumonia in some parts of Afghanistan. Mucilage released by soaking seeds has a soothing and demulcent action when taken internally and is used in the treatment of sore throat and respiratory diseases, particularly in children. This mucilage is also applied externally to minor burns and use for eye lotions. 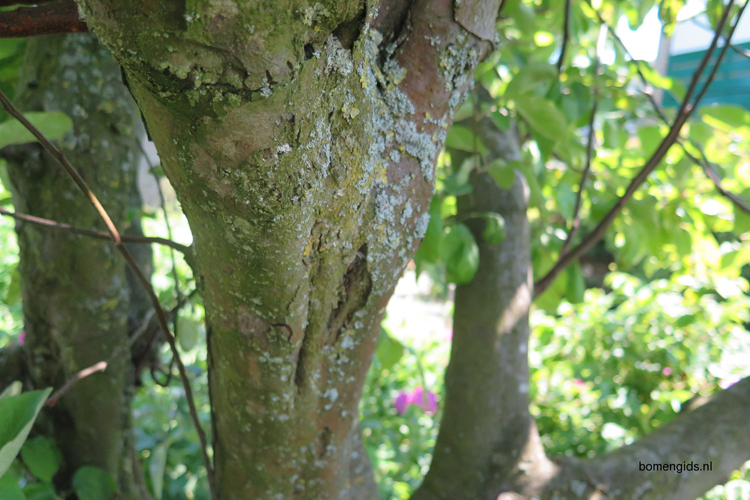 Studies in Iran reported that quince seed mucilage proved to hasten wounds more rapidly than a commercial wound healing cream or eucerin cream without mucilage. Quince leaves are used as decoction or infusion, in folk medicine for their sedative, antipyretic, anti-diarrheic and antitussive properties and for the treatment of various skin diseases. 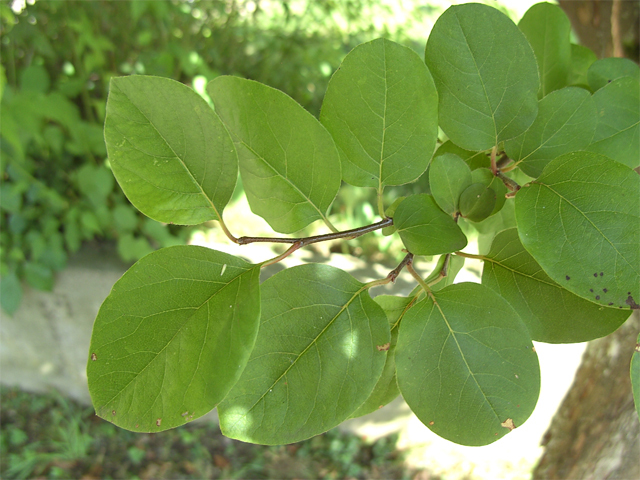 Cydonia oblonga leaves are used as a folk remedy for the treatment of diabetes in Turkey. Gencydo, a combination of lemon (Citrus Limon) juice and aqueous quince (Cydonia oblonga) extract has been used traditionally in anthroposophical medicine for treating patients with allergic rhinitis or asthma in Germany. Quince is very widely used as rootstocks for pears and is also suitable for loquat. 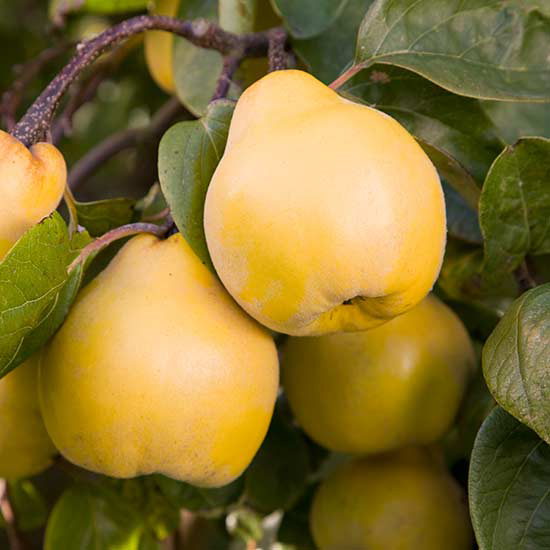 Quince has the property of dwarfing the growth of pears, of forcing them to produce more precociously, and to bear more fruits, instead of vegetative growth, and of accelerating the maturity of the fruit. Quince flower is also a rich nectar source for bees. Quince fruit because of their strong and rich fragrance was once popularly used as room deodorizers. Mucilage from the seed coat is used as a gum Arabic substitute to add gloss to a material. Quince leaves contain 11% tannin and can be used for tanning. Quince fruit season starts by September. Fresh fruits usually arrive in the united states markets from the Georgia, Armenia, Turkey as well as Middle East. Within the markets, select well-developed, firm, vibrant golden-yellow color fruits. Prevent green, premature, since they are nasty and also inedible. In addition, prevent injured, shriveled ones since they are out from taste. Once in your own home, Quinces remain well for approximately a week whenever kept open in cool, darkish spot faraway from heat, and also moisture. They store for many weeks positioned in the fridge. Raw quince is incredibly bitter and also astringent since it has seldom consumed uncooked. Its nasty flavor and also choking feeling in the mouth is because of particular chemical substances within the fruit referred to as tannins. Cooking ruins these types of substances whilst maintaining aromatic rich essential oils and also aliphatic compounds within the fruit. With the help of sugar or even honey, the fruit tends to make superb tasty fairly sweet and also delicious recipes, jams, jellies, and also preserves. To prepare, simply wash the fruit within cold water. Trim the fruit in quarters since you do in apples and pears. Eliminate central core, as well as seeds utilizing paring knife. Cut In tiny pieces or even wedges and add in the cooking. Quince fruit tends to make fantastic addition within the confectionary. A number of the conventional sweet special treats just like pies, marmalade, cakes, jams (membrilo) jellies, tarts etc., utilize this particular fruit to get unique taste. It can also be utilized in stews, sea food, poultry, and also lamb preparations like a flavoring base. Quince fruit seeds usually are toxic and ought not be consumed. Raw fruit could cause discomfort within the throat and may even result in inhaling and exhaling problems. Calories 52 Kcal. Calories from Fat 0.81 Kcal.